Ditch the paper and make these amazing edible placecard tags for your next dinner party! 1. Beat the butter, brown sugar and molasses together until light and fluffy. Add the egg, beating well after the addition. 2. In a separate bowl, sift the flour, ginger, baking powder, baking soda, salt, cinnamon and allspice. Add this to the butter mixture and stir until blended. Shape the dough into 2 disks, wrap and chill for about an hour up to 2 days (the dough will still be soft, even once chilled). 3. Preheat the oven to 350 F and line 2-3 baking trays with parchment paper. On a lightly floured surface, roll out the first disk of dough until just over 1/8-inch thick. Use a knife or pasty roller to cut out rectangles about the size of a standard business card (3-x-2 inches) and smaller rectangle strips, about 2-inches long by ½-inch wide. Lift them carefully to the prepared trays, leaving about ½-inch between them. Any scraps can be stored chilled and then re-rolled until it has all been used. 4. Bake the cookies for 15-18 minutes until you see them brown a little just around the edges. Let the cookies cool for a few minutes on the tray before removing to cool completely. 1. For the royal icing, beat the meringue powder, icing sugar and warm water with an electric mixer until peaks form (approximately 10-12 minutes). 2. 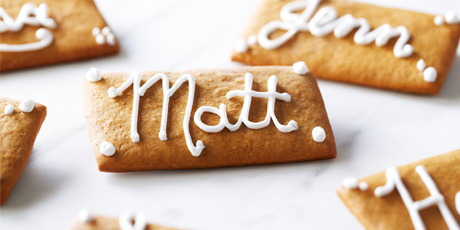 To assemble, spoon the royal icing into a piping bag fitted with a small plain tip. Pipe names and designs on the larger rectangular pieces. To have the placecard tags sit facing your guests, adhere the narrow strips onto the back of the tags using the royal icing. Allow the placecard tags to dry for 2 hours. 3. The cookies will keep up to a week in an airtight container.